The number of job openings in Singapore rose last year amid a tight labour market, the Ministry of Manpower (MOM) said in a new report released yesterday. There were 61,900 job vacancies in September 2013, a 9.7 per cent increase from the 56,400 the year before. Overall, vacancies as a proportion of total manpower demand over the year rose to 3 per cent, up slightly from 2.8 per cent in 2012, according to the report published by MOM's Manpower Research and Statistics Department. Rather unexpectedly, the services industry accounted for four in five of all job vacancies here. These were mainly in community, social and personal services; accommodation and food services; wholesale and retail trade; and administrative and support services. Overall, there were vacancies across all occupational groups here. Positions for service and sales workers - such as shop sales assistants, waiters and security guards - made up the largest share (25 per cent) of all vacancies. This was followed by positions for associate professionals and technicians (17 per cent), cleaners, labourers and related workers (14 per cent) and professionals (14 per cent). Among PMET (professionals, managers, executives and technicians) openings, teaching professionals continued to top the list on the back of strong hiring in the public sector. This was followed by mechanical engineers, civil engineers, and software, Web and multimedia developers. By industry, manufacturing's share of vacancies remained largely similar over the year at 13 per cent, while vacancies in construction dipped to 6.4 per cent in 2013, from 7.5 per cent the year before. While the proportion of job openings that remained unfilled for six months or longer held steady at about 40 per cent, the absolute numbers were higher last year (23,320) than the previous year (20,930). Most of these extended vacancies were for non-PMET jobs, such as service and sales workers. In the MOM report, employers said they continued to face challenges in attracting locals to take up lower-skilled jobs. 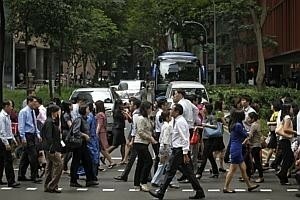 Some 66 per cent of employers reported difficulties in finding Singaporeans and permanent residents to work in these lower-end positions last year, about the same proportion as in 2012. Employers cited unattractive pay and physically demanding tasks as the key reasons for Singaporeans not wanting to fill jobs, such as cleaners, assemblers and machine operators. On average, it was reported that about 90 per cent of vacancies for these lower-end jobs were considered hard to fill by locals, compared to just 36 per cent for PMET vacancies. Michael Smith, country director for recruitment specialist Randstad Singapore, said the increase in job vacancies demonstrates the "optimistic business sentiment" in Singapore in an uncertain global economic landscape. "Throughout 2013, many businesses created new positions to support expected business growth, and this in turn fuels vacancy creation. Confidence in the local economy also encourages Singaporean workers to explore their options in the job market," he pointed out. As for the tightened policies on hiring foreign workers, Mr Smith noted that more companies have adapted their human resource strategies to open up a wider local talent pool as a result. "As companies in Singapore struggle to find and retain talent, organisations need to adopt flexible working arrangements to attract a more diverse workforce, such as mature-age workers and return-to-work mothers, to drive business growth," he added.